While there are plenty of brilliant private jets worth investing in on the market, settling on your model of choice is just the beginning when it comes to creating your perfect plane. 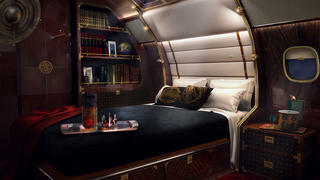 Thanks to their weight and space restrictions, private jets are the ultimate interior design challenge for even the most experienced designer so to help Embraer has created five interior concepts for its super-luxury Lineage 1000E jet. Taking inspiration from influences as disparate as classic yachts, American ranches and the Manhattan skyline, there’s sure to be something to spark your creativity. Manhattan Featuring a classic gentleman’s club-style interior with Art Deco influences, the Manhattan is equal parts sophistication and fun. On entry guests are met with a stunning metal mural of Manhattan inspired by that found in the Empire State Building before discovering an opulent space decked out in mahogany, brass and leather. Split into distinct areas for business and pleasure, the highlights are undoubtedly the Cloud Club – a lounge bar inspired by the Chrysler Building complete with retractable bar stools and a panoramic window – and the Crystal Room, a resplendent private dining space for six guests. While there are plenty of brilliant private jets worth investing in on the market, settling on your model of choice is just the beginning when it comes to creating your perfect plane. 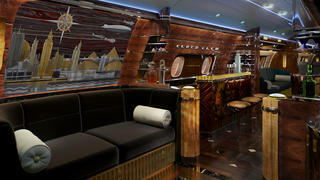 Thanks to their weight and space restrictions, private jets are the ultimate interior design challenge for even the most experienced designer so to help Embraer has created five interior concepts for its super-luxury Lineage 1000E jet. Taking inspiration from influences as disparate as classic yachts, American ranches and the Manhattan skyline, there’s sure to be something to spark your creativity. Featuring a classic gentleman’s club-style interior with Art Deco influences, the Manhattan is equal parts sophistication and fun. On entry guests are met with a stunning metal mural of Manhattan inspired by that found in the Empire State Building before discovering an opulent space decked out in mahogany, brass and leather. Split into distinct areas for business and pleasure, the highlights are undoubtedly the Cloud Club – a lounge bar inspired by the Chrysler Building complete with retractable bar stools and a panoramic window – and the Crystal Room, a resplendent private dining space for six guests. If your tastes are more west coast then perhaps the Hollywood is for you. Designed in a palette of light, warm shades with chrome accents; it is not hard to imagine Marilyn Monroe, Rita Hayworth and fellow stars of the silver screen unwinding on one of the luxurious tufted divans. 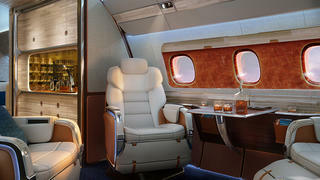 The glamour of Hollywood’s golden age is seen throughout the jet in backlit crystal sculptures, Art Deco-style windows, metallic upholstery and marble finishes. The stand-out piece, however, is a gorgeous narrative artwork sculpted in leather chronicling the history of Hollywood with images of Sunset Tower, Howard Hughes and the iconic cars of the age. If your tastes are more west coast then perhaps the Hollywood is for you. Designed in a palette of light, warm shades with chrome accents; it is not hard to imagine Marilyn Monroe, Rita Hayworth and fellow stars of the silver screen unwinding on one of the luxurious tufted divans. The glamour of Hollywood’s golden age is seen throughout the jet in backlit crystal sculptures, Art Deco-style windows, metallic upholstery and marble finishes. The stand-out piece, however, is a gorgeous narrative artwork sculpted in leather chronicling the history of Hollywood with images of Sunset Tower, Howard Hughes and the iconic cars of the age. Designed by Eddie Sotto of SottoStudios, Skyacht One takes its design cues from John Hacker 1939 classic yacht Thunderbird and features the cream and teak shades so familiar to those who enjoy spending time at sea. Available to purchase as a custom commission through SottoStudios, Skyacht One offers its owner a bedroom with double bed and en suite shower room, dining area and bar/lounge area. All details can be personalised for the owner but Sotto’s initial designs feature Reidel crystal, a vintage Fornasetti china service and a bespoke Fiore Mariano carpet, also by Fornasetti. 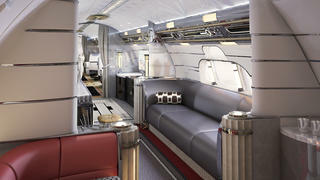 Eschewing eye-catching fixtures for the organic brilliance of natural light, the Kyoto Airship concept utilises huge expanses of glass to create a private jet interior like nothing else currently available. Designed in collaboration with Patrick Knowles, the interior designer behind yachts including Skyfall and Kolaha, cutting-edge technology means panoramic views can be seen from every seat while a light, minimalist design gives the cabin an open, airy feel. This does not, of course, mean luxury has been forgotten. Customisation is key and Embraer believes that this concept allows the kind of personalisation usually only found in the world of superyacht interiors. For example, having designed with a hypothetical Japanese customer in mind, seating allows for both a traditional configuration or options for those who would prefer to sit on the floor, while strategically positioned floor-to-ceiling windows and skylights bring the outside in but still preserve privacy. 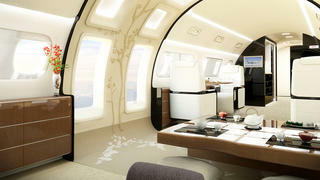 Eschewing eye-catching fixtures for the organic brilliance of natural light, the Kyoto Airship concept utilises huge expanses of glass to create a private jet interior like nothing else currently available. Designed in collaboration with Patrick Knowles, the interior designer behind yachts including Skyfall and Kolaha, cutting-edge technology means panoramic views can be seen from every seat while a light, minimalist design gives the cabin an open, airy feel. This does not, of course, mean luxury has been forgotten. Customisation is key and Embraer believes that this concept allows the kind of personalisation usually only found in the world of superyacht interiors. For example, having designed with a hypothetical Japanese customer in mind, seating allows for both a traditional configuration or options for those who would prefer to sit on the floor, while strategically positioned floor-to-ceiling windows and skylights bring the outside in but still preserve privacy. A second interior design by Eddie Sotto, Skyranch One takes its inspiration from America’s expansive open spaces and offers guests a relaxed country club feel. Versatility on board is key to the Skyranch One concept and each of the jet’s spaces features interchangeable elements allowing the owner to transform a dining area into a boardroom or bar into a living room as the need arises. Interior decoration is largely in leather with seats upholstered in light grey, cream and tan, while Hermes-inspired wall coverings help to further soften sound within the cabin. Further design elements come courtesy of a bleached wood bar, horn-rimmed windows and soft mood lighting throughout the jet. A second interior design by Eddie Sotto, Skyranch One takes its inspiration from America’s expansive open spaces and offers guests a relaxed country club feel. Versatility on board is key to the Skyranch One concept and each of the jet’s spaces features interchangeable elements allowing the owner to transform a dining area into a boardroom or bar into a living room as the need arises. Interior decoration is largely in leather with seats upholstered in light grey, cream and tan, while Hermes-inspired wall coverings help to further soften sound within the cabin. Further design elements come courtesy of a bleached wood bar, horn-rimmed windows and soft mood lighting throughout the jet.